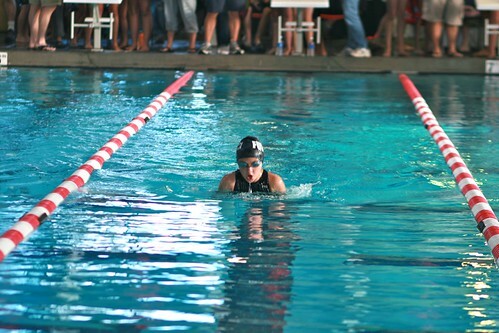 This weekend, Elisabeth swam in her first meet since joining a competitive (year-round) swim team this fall. I was blown away with how much better her strokes and turns already looked (I think watching her hero Missy Franklin this summer, really observing Missy's strokes, was a help, as well as the great coaches she now has), and she swam seconds faster (more than 5 seconds faster, in some races) than she had by the end of the summer season. I'm amazed by her focus and her strength, both of body and will. Although she and I are similar temperament-wise (some might say "explosive"), we are also different enough that I'm impressed and humbled by her. She is much more motivated and driven at ten than I've ever been, about most things. Though I'm a perfectionist, I'm not as competitive and determined as she is. I'm proud of her, as an athlete, a pianist, and especially as a person. I'm still struggling, existentially, with the idea that I have this daughter who competes in a sport at already a pretty high level, who has read the entire Lord of the Rings, who makes outlines and writes essays and uses words like "subtle" correctly. I kind of feel like I'm the mama of little ones, like that's what I'm good at. Even though things have changed gradually and in very seamless ways, when I stop to reflect on all of this, I feel more than a little surprised by it all. I feel like she's still supposed to be that wide-eyed five-year-old. But, oh, she is so much more. She is gracious and serious and strong and funny. She turned ten six months ago and I wanted to write something about it here, but I didn't. I thought it was mostly because I was in constant pain with my kidney stone and stent, and then right after my surgery, our house went under contract and things moved forward. But of course, I also didn't know what to say, and I still don't. She's more than half grown. When she was born, I had no idea where it was all going. Of course, I still don't, and we have still a long time with her here in our nest. But now I see that all the decisions we have and haven't made have, in so many ways, led to her being the girl she is now: a reader, a thinker, a lover of fantasy and art, an athlete, a musician. I don't worry about her. I worry about her brother, constantly. But I know Elisabeth, inside and out. I want to hold onto her, for as long as I can. But I don't worry about her. I am awed, though, that I am her mother. We never know if we're quite up to the task of parenting the children we've been given. Maybe we are, and maybe we aren't. But to be humbled, and inspired, and to learn more about ourselves through them, that is amazing.